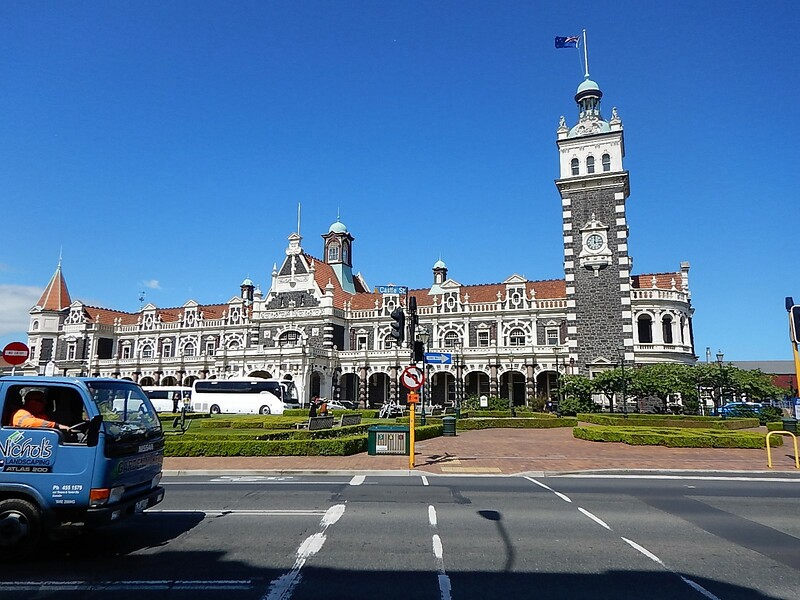 From Queenstown, we drove across to Dunedin on the east coast, taking a detour from the main road to visit a small, pretty, historic town called Clyde on the way. 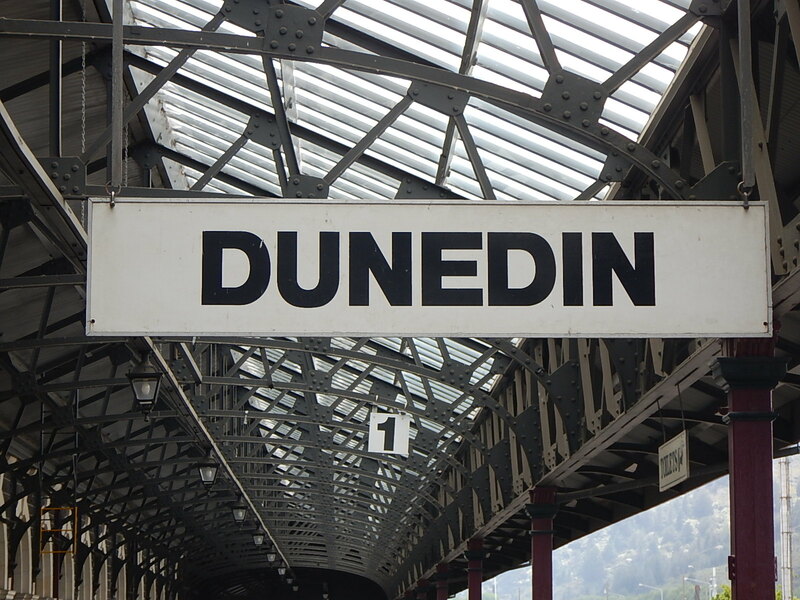 Dunedin, named after Edinburgh, is the oldest city in NZ, the drive was as scenic as ever, lakes, mountains, plains and vineyards, we are starting to get blasé about the wonderful scenery!! We stopped on our way to pick up some crisps and beer to enjoy while we watched the American election results come in, filled with hope and confidence Mark picked up a bottle of Sparkling wine to celebrate… more of that later! Our B&B in Dunedin was called Hilltop which raised our suspicions, sure enough after dropping in to the Tourist Information office and having a quick look around the town centre we headed up (and I mean up) High Street to find our lodgings, and the near vertical on street parking outside. Hilltop was another beautiful historic house and as the name suggests had fabulous views across the city and out to sea. Our host Cally showed us to a grand room with ornate plaster work across the ceiling, a chandelier and stained glass windows, she also invited us to join her for a glass of wine later. We settled in, checked the NZ TV channels for election coverage, there wasn’t any so we fired up the computer to watch online. We were shocked to discover Trump was ahead of Clinton but it was early days and lots of states still to call. We sat and watched initially hopeful but then with growing despair, by 6.30 we couldn’t watch any more so we went to find Cally and claim a glass of wine. Cally was chatting to a friend who had dropped in unexpectedly, when we told them what was happening they didn’t believe it and were horrified when they turned on the evening news and found we were telling the truth. After spending an hour discussing the developments and generally putting the world to rights Cally called an Italian restaurant in town and booked us a table. We left the sparkling wine in her fridge untouched. We walked in to town down High Street, it took about 20 minutes and was so steep it was difficult to walk down, Cally had advised us to get a taxi home later which we did, after sharing a pizza – we didn’t have much of an appetite. Much to our surprise the sun did come up on Thursday so we walked back in to town and bought a ticket for the one hour bus tour of Dunedin, it seemed like the only way to see more of the town which was all hills whichever way you looked. The tour was great, it took us through the old parts of town, through the university area, through a park which was originally the city greenbelt and which has been protected even though building has spread beyond it now. Along the way the driver shared lots of interesting stories about the history and life of the city. One stop was billed as the steepest street in the world and having seen it we are inclined to believe it. 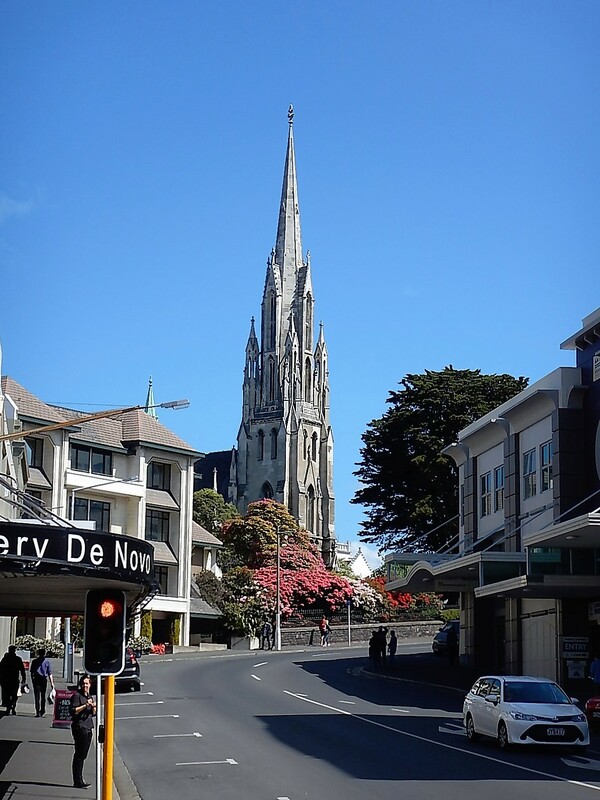 Dunedin claims six of the ten steepest streets in the world but I don’t know who measures them; there are several streets which are paved with concrete instead of tarmac, apparently when they get warm in the summer the tarmac runs downhill and collects in humps at the bottom! After the tour we had coffee at a café called The Dog with Two Tails which has just been voted best café in NZ, quite an accolade! From there we headed to Speights Brewery just in time to join a brewery tour and tasting, there are three main breweries in NZ and Mark was keen to visit one, we had missed the other two so this was our last chance. The tour was interesting and the tasting went well too. On Thursday night, at Cally’s suggestion we went to a much-respected restaurant called Plato, it was in an old seaman’s mission on the edge of an industrial estate near the dock(! ), we never would have found it on our own and they can’t get much passing trade. From the outside it looked like a scout hut running a jumble sale, inside it looked like… a scout hut running a jumble sale. All the windowsills were crowded with 1950’s and 60’s ceramic coffee pots, lots of flowery patterns and brown glaze, in between the tables were low bookshelves filled with miscellaneous bric-a-brac, very odd. That said the staff were brilliant and so was the food, we had duck pate to start and pork tenderloin with clams in a buttery, peppery sauce to follow. Excellent, we also got a taxi back to Hilltop.